I replaced the factory stereo in my 1998 ES300 this weekend, and I did NOT have to bypass the factory amplifier. No messing with the factory amplifier was necessary! The only splicing I had to do was on the aftermarket stereo connector and the Metra wiring harness. I did not go into the glove box or cut any stock vehicle wires. My stock stereo looks nothing like the picture in the OP, but I can verify that the sound from my new stereo plays through the factory amp to the factory speakers. This is a great tutorial BUT-you did not mention the factory subwoofer in the middle of the deck-do you lose that with this installation or did your car even have one? thanks much! after watching your tutorial I was dreading all this rewiring-on my 99 ES300 with non-Nakamichi system I ordered a Pioneer dual DIN head unit and installed the provided harness from Crutchfield-(I made sure the unit I purchased had dual RCA outputs) I plugged into factory harness and as you stated-unit came on but no sound-i was goint to just forget it and return to Crutchfield but decided to call them and immediately the tech knew my problem-I had not connected the blue/white striped remote antenna wire on the new unit to the supplied harness. I don't have a remote controlled antennae so didn't think it would be necessary but the tech explained that THIS is what turns on the factory Lexus amp! hooked that wire up and VOILA-all speakers work perfectly, including the sub-no rewiring necessary-Easiest install I have EVER done! For those that used the metra harness with the RCA's and didnt bypass the factory amp do you get any engine whine/low static through your speakers with the volume turned all the way down? Ace20Six ---I did get a tiny bit of engine whine-but it is so negligible I am not going to install a filter-can barely be heard at all, and of course not AT all when music is being played! Yes, I did. Use RCA filters and it will go away. 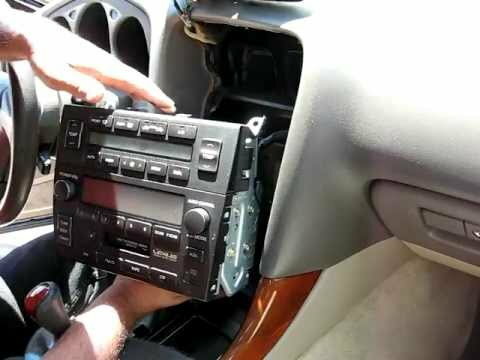 [QUOTE=AWehland88;8721724]I recently installed an aftermarket radio into my 1998 Lexus es300. I, like many people, didn't want to spend big $$ at a shop to get them to put it in for me. However...Lexus is a PAIN to modify, (even the older models) and I couldn't find a thread that was newer than 2005 on the subject, so now that I have successfully done it, I am going to do my own write up. I hope that this thread helps save some of you from having to look for hours online. 1) We need to start by disconnecting the battery terminals from the car. this will ensure that nothing will short and the airbag won't deploy while you are working around the glove box area. 2) Remove one of the top air vents from the air console above the stock radio, then carefully pull the rest of the air vent cover system out and disconnect the two harnesses attached to the back of it. You will see two bolts that hold in the radio. Then underneath the climate control console and above the ashtray/cigarette lighter, pry off the small trim piece. You may have to pull out the cigarette holder and ashtray to get at the bolts, but I didn't, so I just left it on. 3) Unscrew the bolts that hold in the climate control and stock radio and pull the whole thing out towards you. When it comes free, disconnect all 4 harnesses and the 2 antennas in the radio/climate control. 4)There will be a bracket on the side that connects the climate control and the stock radio together. Unscrew all screws with your Phillips head, and set the stock radio and cage off to the side, you will not need them anymore. Use the instructions that come with the metra dash kit to assemble it. You will need to re-use the screws that you took out of the stock radio and cage in order to assemble your new radio into the dash kit, so don't discard them! 5) Take your metra wiring harness, as well as your harness for your aftermarket radio (in my case the pioneer deh-150) and color match the available wires. Black to Black, Yellow to Yellow, Red to Red, Blue/White to Blue/White etc. Be sure to tape up or crimp cap the wires where you connected them. At this stage in the installation I was left with the 4 RCA plugs, and a blue wire on my metra harness(my aftermarket radio didn't have the blue antenna wire) and white/white black, green/green black. purple/purple black, and gray/gray black on the aftermarket radio harness. Leave the wires on the aftermarket harness alone for, we will come back to it later. Using your wire cutters, cut away the RCA port wires and tape the ends of them, along with the end of the unused blue wire because they will not work! Trust me, I tried plug and play and it will not happen! after doing all of this, connect your metra harness to your factory radio plug, and connect your aftermarket harness and the large antenna to your aftermarket radio. Plug the battery in and make sure that the radio turns on. You will not hear music clearly yet. If it works, then disconnect the battery again, and proceed to stop 6. If not, check the connection of your wires again. In order for the sound to play through the speakers, we will have to bypass the factory amplifier in your Lexus. In order to get to the amp in the 98 es300, you have to take apart the gloveboxcause it is behind there. I should note that my particular car did not have a cd player in the glove ox like many of the es300 models, so additional steps may have to be taken to remove that if you can not get to your amplifier by just the steps I will outline. 6) Open your glove box to reveal 3 Phillips Head screws holding it in. Remove these. There is a bolt holding in the underside of the glove box panel, and in order to get to it, you will have to remove the trim on the door frame...it should just pop off. Once you reveal the bolt, remove it and pull the glove box gently out. There will be 2 harnesses that connect to the glove box/air bag, disconnect them and pull the box all the way out. 7) Locate the amplifier. you will not have to remove the amp, Remove the two smaller harnesses. This diagram will help you figure out which wires I am talking about, so when I refer to numbers, please look at that. Leave harness A where it is. It sends power to the headunit. let's start with harness B. As you can see from the diagram it is responsible for the rear speakers. 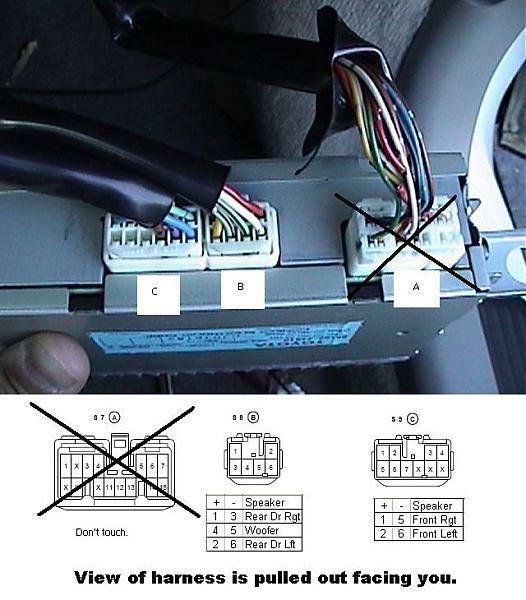 Cut a length of speaker wire that is long enough to reach from the glove box to the headunit. In diagram B locate wires 1 and 3 and cut them. Connect the speaker wire to each wire respectively. I used the negative side of the speaker wire with wire 3 and the positive with wire 1 just to make it easier to identify on the other end Tape them off or crimp cap them. Snake the speaker wire through the glove box and into the empty space where the aftermarket radio will be. Connect wire 1 to the purple wire in the aftermarket harness and wire 3 to the purple black. Repeat with the rest of the wire connections as shown here. 8) Once you have all the connections taped up and threaded through in place, reconnect the battery and test for function. At this point all your speakers should sound normal and all of your components on your radio should work well. Secure your connections by zip tying or wrapping a few strands of electrical tape to keep the wires together. Put your glovebox back together by reversing the process you took it apart in. Install the metra dash kit into the empty radio slot according to the instructions in the manual it came with, then reassemble the climate control and air vents back together. Reconnect the battery again if you disconnected it to reassemble, and enjoy your new radio! I hope that this updated thread will help some of you with older model lexus es300 cars.[/QUOTE. 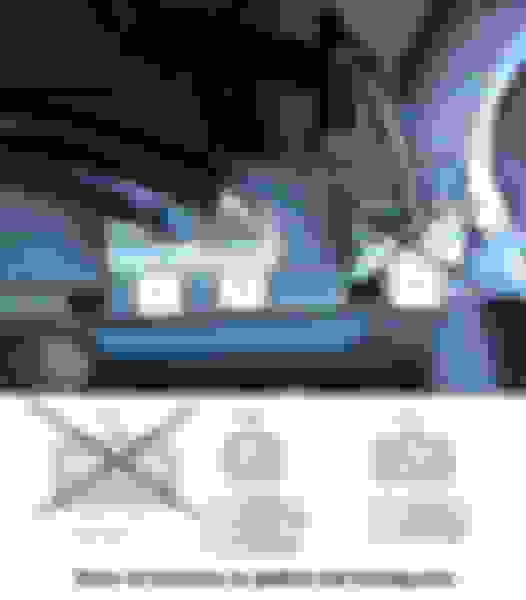 That meaning only having to connect the speakers to the amplifier? I have the TY 140 harness. Radio turned on the all and trying to figure the blue/white wire i shorted something and the radio won't turn on. so to what wire i hook up the Blue/White wire too ?